If you ask my opinion, minestrone is probably the best soup around. It’s such a delicious compliment of Italian flavors, pasta, and the freshness of the best vegetable soups. I love that you can eat a big bowl of it and feel nice and full-up but not gross. Depending on how you make it, a good minestrone can actually be quite healthy too. 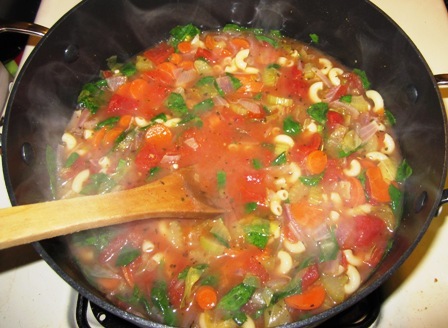 This minestrone is no exception: made with delicious fresh vegetables, low-sodium bouillon, and a higher fiber macaroni noodle, it’s low on fat and calories but not on taste. In a 3-qt. saucepan, saute carrots, cabbage, celery, onion and garlic in oil for 5 minutes. Add water, tomatoes and bouillon; bring to a boil. Reduce heat. Simmer, uncovered, for 20-25 minutes or until vegetables are tender. Stir in spinach, macaroni, pepper, and seasonings; heat through. Makes 4 to 5 1-cup servings. Dietary Fiber: About 3 g but will vary based on macaroni used.